Reaching MU Stage 1 was fairly straightforward, and a lot of health systems were able to do that. Unfortunately, Stage 2 is really a heavier lift. There are more requirements and more technical challenges related to that, and there are also operational challenges. When you start getting into actual engagement of the end users and the caregivers, there’s potential resistance and difficulties. That’s where change management and communicating what you’re trying to do are so important. If workflows are developed by people that don’t truly understand the nature of what needs to be done, you don’t end up with a product that’s going to be generally acceptable to the end users. There are different ways for an organization to expand. You can expand through building hospitals and buying hospitals and things like that, or you can expand by partnerships with other health systems. Gamble: It makes perfect sense when you have these best practices to share them. There’s no need for people to reinvent the wheel when you’ve figured out a way that it works. Gamble: Can you walk through how this usually goes? Do you go to certain organizations, and how do you start to share these practices? Krieger: Most of this external work really comes from inquiries that are directed to the Cleveland Clinic. 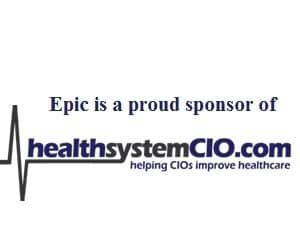 Certainly health IT has a network and we talk to one another, but we get a lot of calls from other organizations that are looking to either improve the way they use their electronic health records or to actually implement a new electronic health record. Those inquiries result in early engagements to try and assess what their needs are, and then we see if there’s a good match and if we can work together. Gamble: What are some of the biggest challenges that you see in the practices that are looking to roll it out? Krieger: I think the challenges that many health systems are facing right now are related to meeting requirements related to Meaningful Use Stage 2 and other mandates. Reaching Meaningful Use Stage 1 was fairly straightforward, and a lot of health systems were able to do that. Unfortunately, Stage 2 is really a heavier lift. There are more requirements and more technical challenges related to that, and there are also operational challenges on how you use those tools. What we’re finding is many systems are looking to organizations like the Cleveland Clinic to help them in those challenges. We have a very talented team that’s worked on those sorts of things and has allowed us to meet the requirements of Stage 1 and now Stage 2, and so we’re able to take those capabilities and then leverage them as part of our consulting experience. Gamble: Is there a particular aspect of Stage 2 that comes up a lot as being more challenging than others? Krieger: I think there are probably two things. Things related to patient engagement and delivering information to the patient has been a challenge, and then the issues surrounding electronic exchange of information between organizations. Interoperability of systems is certainly difficult, and so these requirements for exchange of information places more strain on that system that’s already very difficult to navigate. Gamble: You said organizations are reaching out to the Cleveland Clinic and they want that assistance, but do you still find that there is some resistance when you go in and do this training? Is there some hesitancy? Krieger: I think you really have to break it down to who you’re engaging. Initially when we worked with another organization, that engagement is usually initiated by the leadership or C-suite, and certainly this is something that they’re looking for, so that level of engagement is easier. When you start getting into actual engagement of the end users and the caregivers, then yes, as with any technology initiative, there’s potential resistance and difficulties. That’s where change management and communicating what you’re trying to do are so important. And that requires efforts on our part, but also requires efforts on the sponsors at the organization to deliver the message that we’re working together to try and meet some goal or fulfill some goals. Gamble: I imagine that’s a tough dynamic because obviously leadership wants to move forward, but you have to have that engagement. Is there anything in particular that can be done by you to try to help with the change management piece, or is it, like you said, having to work with leadership and the staff as well? Krieger: I think ultimately that sort of engagement is the responsibility of the local leadership. But what we can do as an organization that’s working with them is to share our experiences on how we have handled those same change management challenges and offer best practices around communications and training and things like that. And hopefully they’re able to follow similar strategies and be successful with them, but ultimately those things need to be initiated by the local leadership. It can’t be done by an outside entity, because that won’t be well-received. It needs to be done by the people most closely aligned with the caregivers. Gamble: Absolutely. What type of staff do you have with you doing the training? Krieger: We have a variety of staff. There’s a dedicated staff that works on our ambulatory offering through MyPractice Community, and some of the MyPractice Healthcare Solutions. But as we enter into other types of projects, we pull staff from our internal resources to help augment those needs. We also have relationships with other entities. One in particular with Dell where we do some collaboration that allows us to augment staff requirements as needed so we can flex up as the need arises for larger engagements. So we can pull staff and we can pull personnel from a number of different places depending upon the needs of the project. Gamble: And you have people on your staff who are clinicians as well? Krieger: Yes. Our core staff — our analysts and builders and things like that — are IT-focused, but generally have clinical backgrounds. We have physicians and nurses and other caregivers that participate in both the development and the implementation of all these systems. Gamble: I’m sure that’s something that can certainly make a difference when a person who’s being trained can turn to them and say, how did you actually do this, and how did you incorporate this into your workflow? Krieger: Right, and I think it’s important, both in the training but also from the development standpoint. If workflows are developed by people that don’t truly understand the nature of what needs to be done, you don’t end up with a product that’s going to be generally acceptable to the end users. But if the end users are really the core group of people that identifies the workflow and helps develop the end product or the experience for that end user, then you have a much greater likelihood of being accepted by the sum total of users rather than something that’s developed in a vacuum without end-user input. Gamble: You mentioned Dell. This is something kicked off earlier this year, right? Gamble: Can you talk a little bit about that? Krieger: Sure. We’ve worked with Dell for a number of years in various capacities and this collaboration really does two things. One, Dell provides an expertise in both the hardware infrastructure and architecture that’s needed to run many of our EHR systems. They offer both a hosted solution as well as a non-hosted solution, but on a platform that is at a lower price point than what is traditionally used for, say, Epic installs or Epic implementations. By combining our expertise and their expertise in hardware, and their experience with healthcare consulting and our expertise in the use of the Epic platform and understanding the needs of the caregivers, it provides a compelling solution that we can offer other organizations. Gamble: You’re really doing a lot as far as the external businesses. That’s something that seems like it’s really become a big focus of Cleveland Clinic. Krieger: I think there are different ways for an organization to expand. You can expand through building hospitals and buying hospitals and things like that, or you can expand by partnerships with other health systems. Certainly though partnerships, the nature of health information technology allows us to connect through our information and provide better care for patients that are often shared by health systems. If we can expand that footprint in that manner through this network of engagement with other health systems, it’s really a more cost-effective way to expand and deliver care to patients, no matter where they’re located.